Results may vary in individual cases. 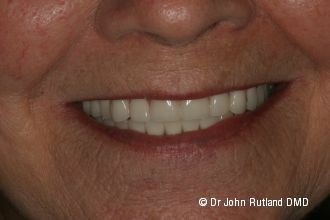 All photos are actual patients of Dr. Rutland. 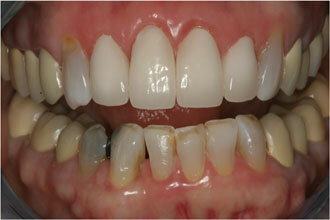 On this case, all porcelain crowns were done to replace old porcelain to metal crowns. A new lower partial without clasps was also made so that the partial clasps are no longer visible. 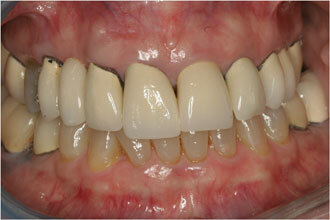 We were able to correct the spacing in the patient’s upper teeth and correct the severely worn lower front teeth. 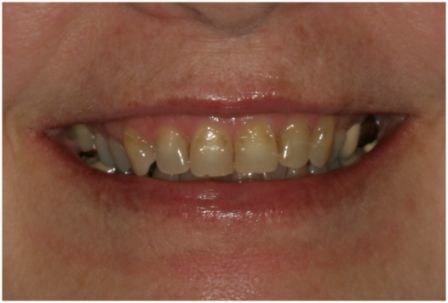 The patient in these photos had an old partial replacing some of her front teeth as well as worn, chipped and discolored front teeth. 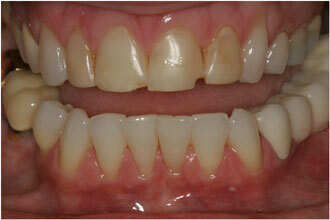 Treatment consisted of a new upper partial plus three porcelain crowns on the worn, short teeth. 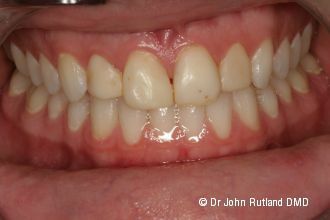 This patient presented to our practice unhappy with the appearance of her upper front teeth due to old, discolored bondings and space between her teeth. 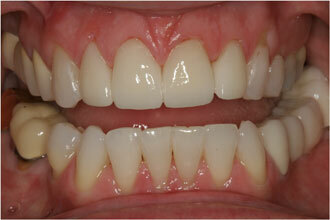 We did 4 porcelain veneers by DaVinci dental lab in California to change the shape, shade, and length of her teeth. 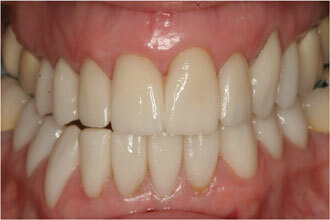 The patient now has a beautiful, attractive smile! 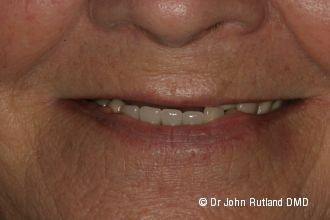 This patient presented to our practice with an old worn upper denture and lower partial that had caused her lips and face to sink in. 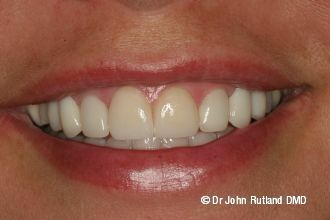 She also did not show her upper teeth at all when she smiled. 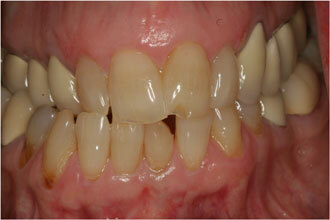 The patient now has a beautiful new smile with her new upper and lower dentures. 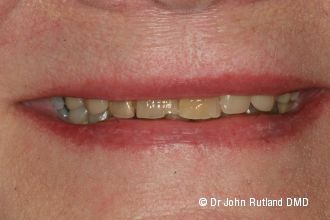 Her upper lip is now supported and more full, and she has nice tooth display when she smiles. 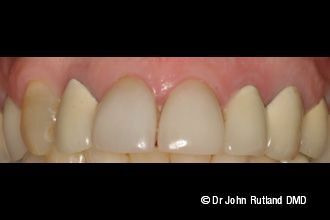 What a difference tooth whitening and 4 front all porcelain crowns make when trying to correct teeth with old fillings, incisal wear and discoloration. 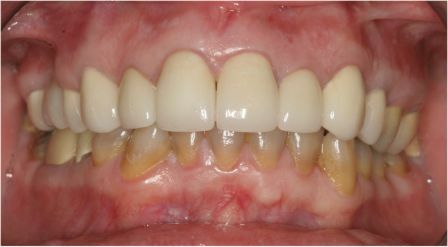 This type of discoloring is known as tetracycline staining. 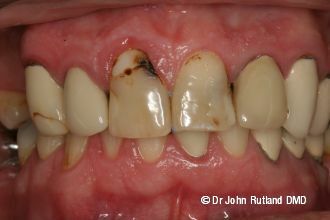 It is caused by taking tetracycline antibiotic while the teeth are forming. 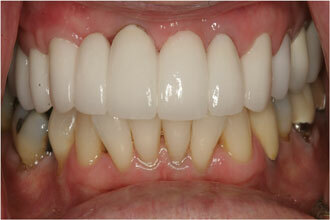 Porcelain crowns with all porcelain margins cover it well with natural looking porcelain. 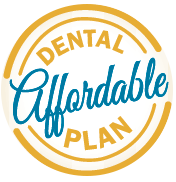 This was a full arch makeover from old porcelain to metal crowns, stained veneers, and worn down teeth to all porcelain crowns in the front and porcelain to gold in the back. 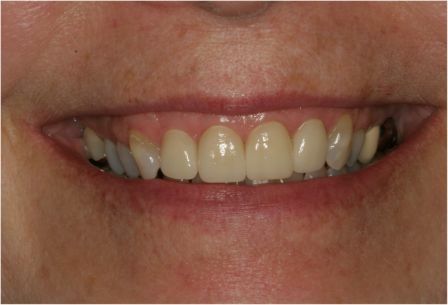 This combination of materials gave this patient the maximum cosmetics with a natural smile as well as the durability to chew food well. 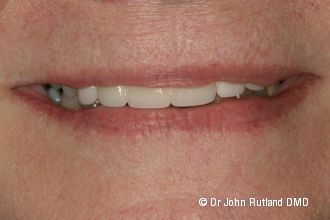 Old porcelain to metal crowns that showed dark lines at the gumline were replaced with life-like cosmetic all porcelain crowns, giving this patient a beautiful and natural looking smile. 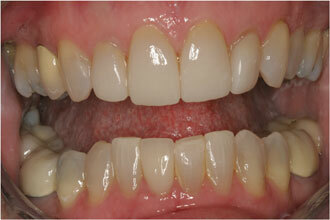 All porcelain veneers and bridges were used to replace old porcelain to metal bridges and close unwanted spaces. 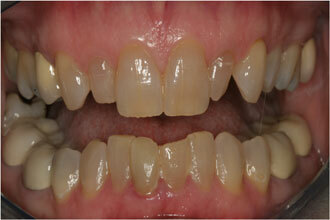 The teeth were resized to the appropriate size and shape for maximum cosmetics. 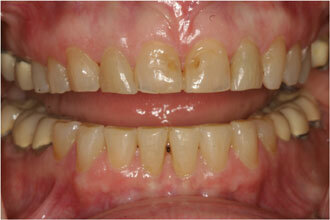 The patient in this case had worn much of the enamel off of her teeth over the years. 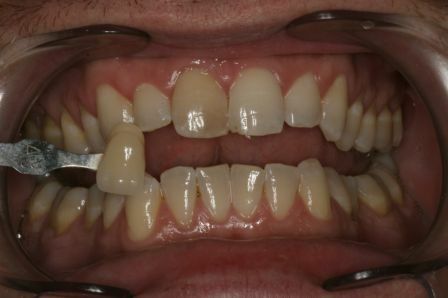 She was unhappy with her short, very dark teeth as well as the worn bite being uncomfortable. 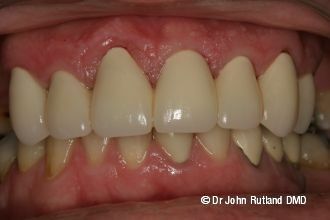 We restored the full mouth case with beautiful all-porcelain restorations to give the new desired tooth shade as well as restore the bite and contours to the teeth. 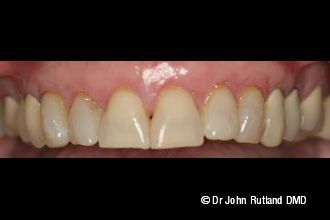 The patient in this case had a history of gum disease which made the old crowns on her front teeth look very long and dark at the gumline. 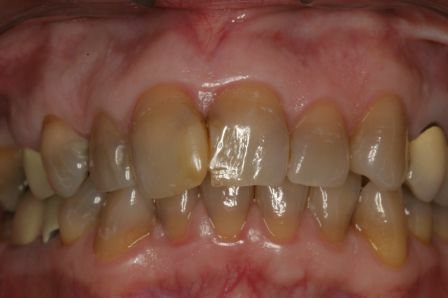 All of the old crowns were replaced with natural looking all-porcelain restorations after gum surgery to graft some of the exposed root areas of the teeth. 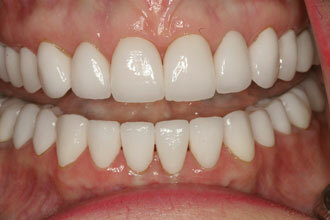 This allows us to shorten the overall length of the teeth and improve the cosmetics. 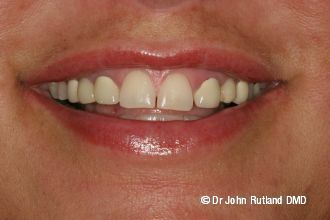 This patient was unhappy with the shade and chipping of her upper front teeth. 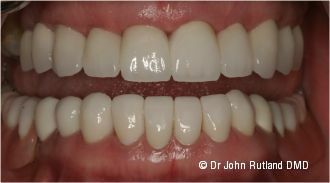 We did full mouth bleaching followed by four all porcelain restorations on the front teeth to achieve a beautiful result! 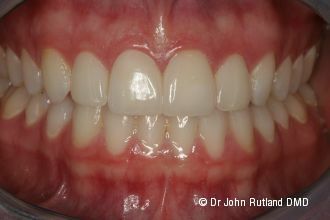 Full upper and lower all porcelain restorations were done on this case to correct the darkness and wear and chipping of the teeth. 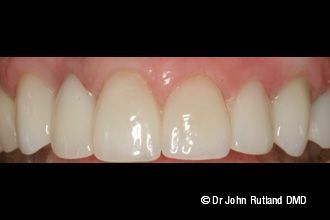 The final treatment on this case was Invisalign treatment to correct the lower teeth crowding and alignment followed by bleaching and four all porcelain restorations on the upper front teeth. 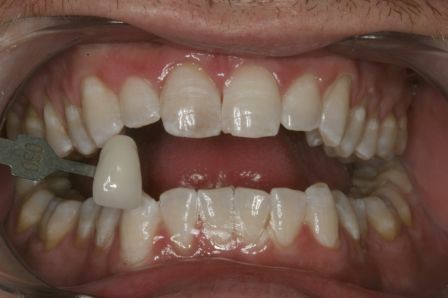 Invisalign treatment was done first on this case to correct the alignment and deep bite in the front. 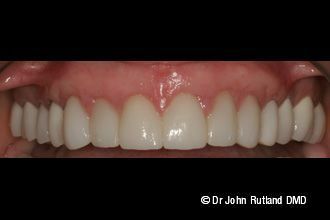 This was followed by bleaching then four porcelain veneers on the upper front teeth to improve the shape and contour. 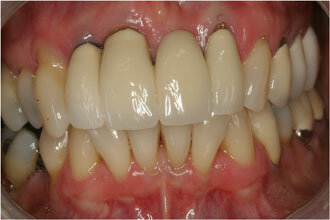 All porcelain bridgework was done on this case to replace old porcelain metal restorations. 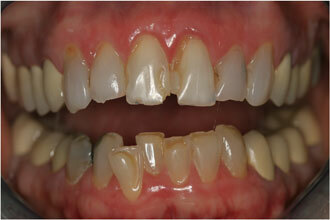 The patient was unhappy with the darkness of the old restorations. 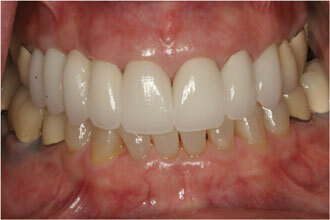 Notice the natural look and translucency of the new all porcelain restorations.